The Pioneer III MU cars were built for the Pennsylvania Railroad for its Philadelphia area electric operations in 1958. The Pioneer III was a Budd Company concept designed to be adapted to any type of railroad requirement, but only the six Pioneer III MU cars for the PRR were ever built. 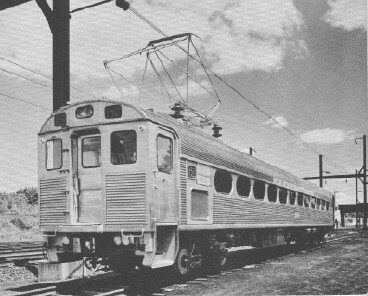 The cars were the ancestors (or, if you like, prototypes) of later Silverliner and Arrow equipment to be built for PA and NJ commuter operations, and were similar in dimensions and basic appearance to the 59 'production' Budd Silverliners (Silverliner II) buit for the PRR and RDG electric operations in Philadelphia in 1963. The Pioneers' major spotting differences were the fluting covering nearly the entire carbody and their diamond pantographs. Mechanically, they had different traction motor ratings and railroad couplers, which meant that they were not able to operate with the later cars, and instead operated as single units and/or a unit train for most of their lives, usually on the PRR's Phila/Harrisburg main line. Two cars were lost to wreck damage over the years, and the remaining four cars were operated in rush hour service by SEPTA until their retirement in 1990. Two cars went to the Railroad Museum of Pennsylvania in Strasburg, PA, while the other two went to the FRA test track in Pueblo, CO, where they were expended in crash tests.